Use an overhaul stand as necessary. (a) Remove the rear differential filler plug and gasket. 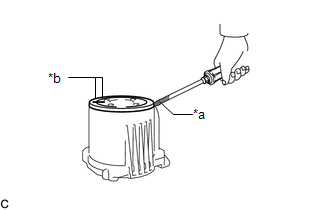 (a) Install a dial indicator and magnetic base perpendicular to the inner side of the electro magnetic control coupling sub-assembly as shown in the illustration. (b) Using SST, rotate the electro magnetic control coupling sub-assembly forward and backward, and measure the vertical runout. If the runout is greater than the maximum value, replace the electro magnetic control coupling sub-assembly. 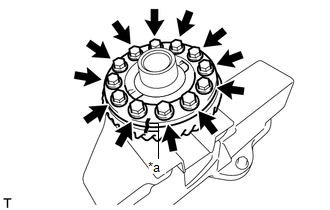 (c) Install a dial indicator and magnetic base perpendicular to the electro magnetic control coupling sub-assembly as shown in the illustration. (d) Using SST, rotate the electro magnetic control coupling sub-assembly forward and backward, and measure the lateral runout. 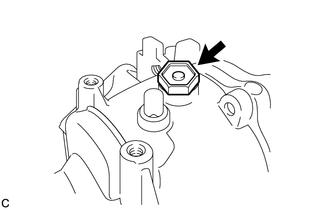 (a) Using a screwdriver, remove the rear differential carrier cover breather plug. (b) Using a plastic hammer, lightly tap the electro magnetic control coupling sub-assembly to remove it from the rear differential carrier assembly. Do not damage the contact surface. 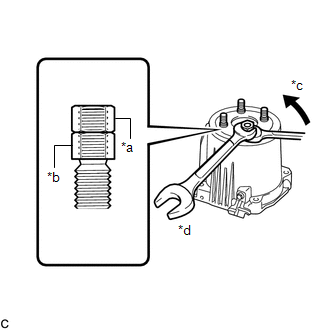 (a) Install 2 service nuts to the stud bolt. (b) Lock the upper nut using the lower nut. (c) Turn the lower nut and remove the other 3 stud bolts in the same way. Prevent foreign matter from entering the electro magnetic control coupling sub-assembly. If the threads of the electro magnetic control coupling sub-assembly are damaged while removing the stud bolt, replace the electro magnetic control coupling sub-assembly with a new one. (a) Put matchmarks on the rear differential dust deflector and electro magnetic control coupling sub-assembly. 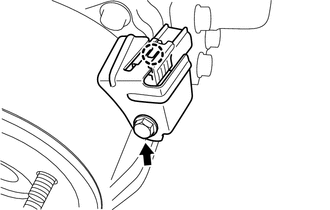 (b) Using a screwdriver, remove the rear differential dust deflector. Pry around the circumference of the rear differential dust deflector uniformly to prevent deformation. Do not damage the end surface of the electro magnetic control coupling sub-assembly. If the end surface of the electro magnetic control coupling sub-assembly is damaged while removing the rear differential dust deflector, replace the electro magnetic control coupling sub-assembly with a new one. (a) Disengage the claw to separate the electro magnetic control coupling wire harness connector. Do not damage the electro magnetic control coupling wire harness. (b) Remove the bolt and connector clamp bracket. (a) Remove the transmission coupling conical spring washer from the rear differential carrier assembly. (a) Remove the transmission coupling spacer from the rear differential carrier assembly. 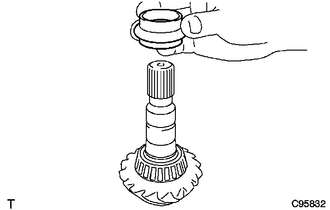 (a) Insert a dial indicator and magnetic base through the rear differential filler plug hole, and set it perpendicular to a differential ring gear tooth tip. 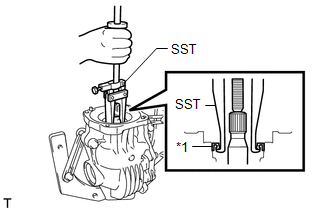 (b) Using SST, hold the differential drive pinion in place. (c) Using SST, rotate the rear differential case assembly forward and backward, and measure the backlash. If the backlash is not within the specification, adjust the side bearing preload or repair as necessary. Measure at 3 or more areas on the circumference of the differential ring gear. 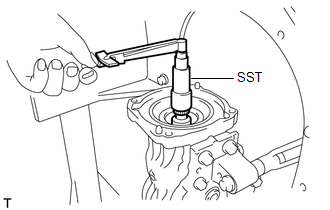 (a) Using SST and a torque wrench, inspect the differential drive pinion preload (starting torque) of the backlash between the differential drive pinion and differential ring gear. If the differential drive pinion preload is not within the specified range, adjust the differential drive pinion preload or repair as necessary. For a more accurate measurement, rotate the rear differential case bearing forward and backward before measuring. 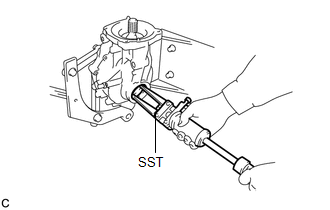 (a) Using SST and a torque wrench, inspect the total preload (starting torque) with the teeth of the differential drive pinion and differential ring gear in contact. If the total preload is not within the specified range, adjust the total preload or repair as necessary. 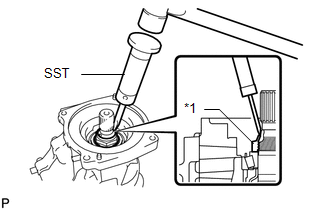 (a) Using SST, remove the 2 rear differential side gear shaft oil seals from the rear differential carrier assembly. 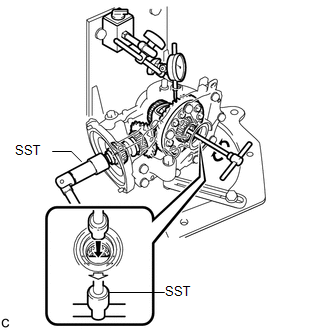 (a) Using SST, remove the diaphragm oil seal from the rear differential carrier assembly. 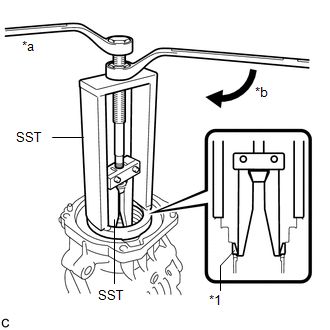 (a) Using SST and a hammer, release the staked part of the rear drive pinion nut. Use SST with the tapered part facing against the shaft. 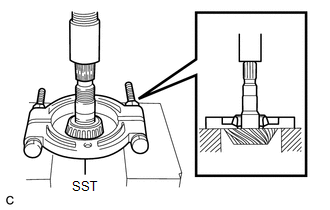 Do not modify the SST tip with a grinder or equivalent. 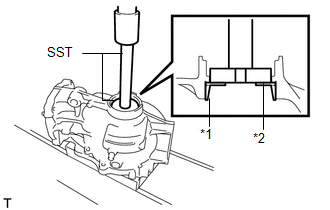 Loosen the staked part of the rear drive pinion nut completely, otherwise the threads of the differential drive pinion may be damaged. 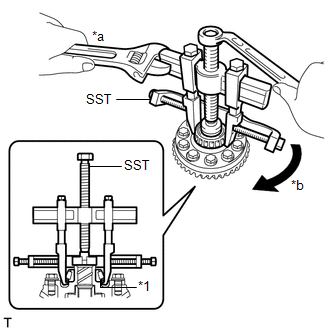 (b) Using SST, hold the differential drive pinion in place and remove the rear drive pinion nut from the differential drive pinion. 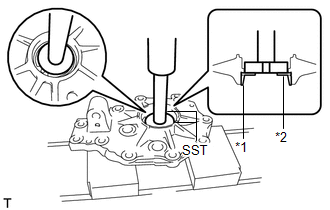 (a) Using SST, remove the rear drive pinion front tapered roller bearing (inner race) from the differential drive pinion. (a) Remove the 10 bolts from the rear differential carrier. (b) Using a brass bar and a hammer, disengage the 2 straight pins and remove the differential side bearing retainer from the rear differential carrier. Set the brass bar on the ribbed part of the differential side bearing retainer. 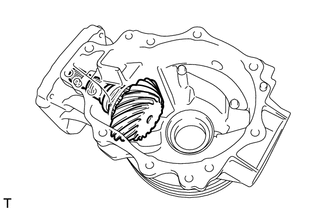 (a) Remove the rear differential case assembly from the rear differential carrier. 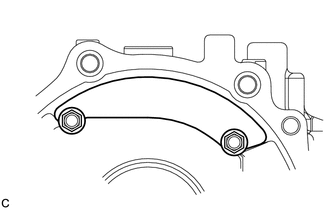 (a) Remove the 2 bolts and rear differential breather plug oil deflector from the rear differential carrier. (a) Remove the differential drive pinion from the rear differential carrier. (a) Remove the rear differential drive pinion oil slinger from the differential drive pinion. (a) Remove the rear differential drive pinion bearing spacer from the differential drive pinion. (a) Using SST and a press, press out the rear drive pinion rear tapered roller bearing (inner race) from the differential drive pinion. Do not drop the differential drive pinion. 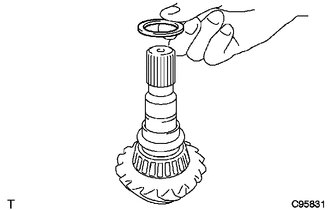 If the differential drive pinion or differential ring gear is damaged, replace them both. (b) Remove the rear differential drive pinion plate washer. 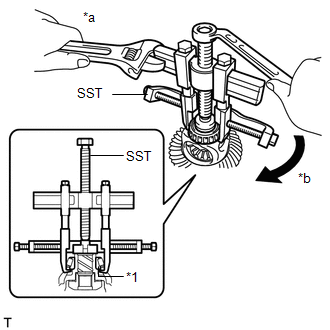 (a) Using SST, remove the rear drive pinion front tapered roller bearing (outer race) from the rear differential carrier. (a) Using a brass bar and a hammer, lightly and uniformly tap out the rear drive pinion rear tapered roller bearing (outer race) from the rear differential carrier. Set the brass bar on the notch. 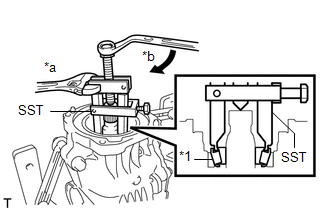 (a) Using SST and a press, remove the rear differential case bearing (LH side outer race) and rear differential side gear shaft plate washer from the differential side bearing retainer. 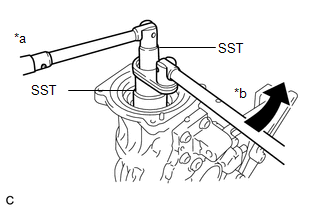 (a) Using SST and a press, remove the rear differential case bearing (RH side outer race) and rear differential side gear shaft plate washer from the rear differential carrier. 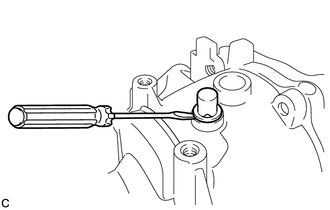 (a) Remove the 4 straight pins from the rear differential carrier. 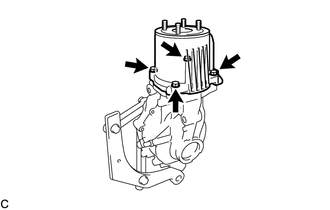 Perform this step only when replacing the rear differential case bearing or rear differential case sub-assembly. (a) Using SST, remove the rear differential case bearing (LH side inner race) from the rear differential case sub-assembly. 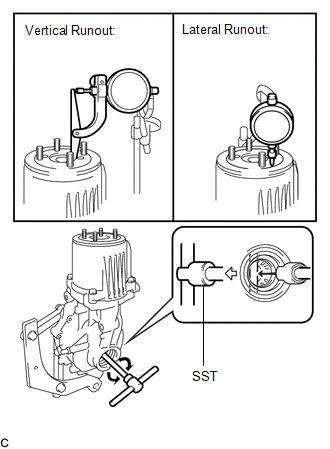 Before using the SST center bolt (09953-04020), apply grease to its threads and tip. 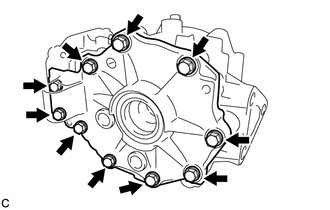 If the race remains on the rear differential case sub-assembly, repeat the step above to remove the race. 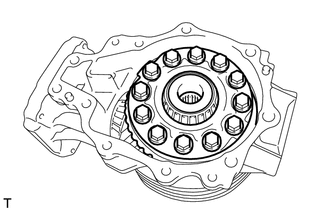 If the rear differential case bearing (LH side inner race) is deformed, replace it with a new one. (a) Using SST, remove the rear differential case bearing (RH side inner race) from the rear differential case sub-assembly. If the rear differential case bearing (RH side inner race) is deformed, replace it with a new one. (a) Secure the rear differential case sub-assembly in a vise between aluminum plates. Do not overtighten the vise. (b) Put matchmarks on the rear differential case sub-assembly and differential ring gear. (c) Remove the 12 rear differential case bolts. 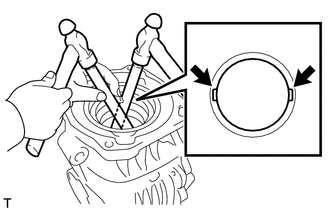 (d) Using a plastic hammer, lightly and uniformly tap the outer circumference of the differential ring gear to remove it from the rear differential case sub-assembly. Do not drop the differential ring gear. If it is difficult to remove, tap the outer circumference of the differential ring gear using a brass bar and a hammer. 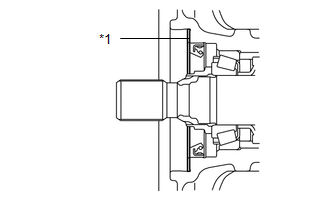 (a) Check the differential pinion gears and differential side gears for wear. If the differential pinion gears and differential side gears are damaged, replace the rear differential case sub-assembly. 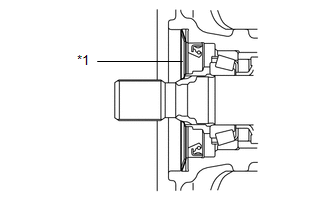 (a) Check the differential case for cracks or damage. 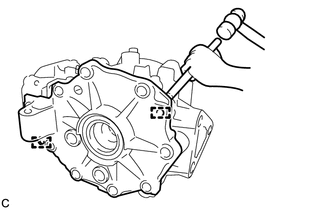 If the differential case is damaged, replace the rear differential case sub-assembly.